INDIO –Jesse Smith threw six scoreless innings, giving up five hits, walking none, and striking out five as the So Cal Snappers defeated the San Diego Knights 6-2 in the 25-and-over Desert Classic finals. “He’s just the ultimate professional, said Snappers manager Frank Sansone. “To beat us when he’s on the mound, you’ve gotta hold us to one or two runs because chances are he won’t give up more than that. He just gets stronger as the game goes along,” Sansone said. The Snappers got on the board with four runs in the first two innings, highlighted by RBI singles by Manny Pimentel and Matt Graves in the first and RBI double by Greg Martinez and an RBI-single Manny Pimentel. Trailing 4-0 in the top of the fourth, the Knights put together their best scoring opportunity as they loaded the bases with one out but were unable to push any runs across against Smith. Sansone once again credited Smith for being able to get out of trouble. “He always finds a way turns up his intensity when guys get on. It’s very rare to get multiple hits against him in one inning and when they do he uses his ability to get out of innings” Sansone said. In the fifth, Bernard walked to lead off, stole second and then came around to score on Adam Geery’s RBI single to complete the scoring for the Snappers. 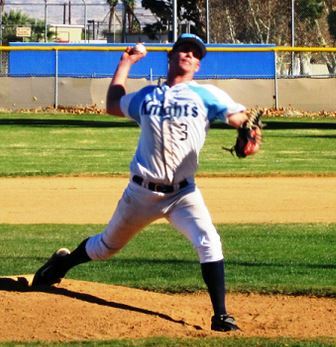 The Knights finally scored in the top of the ninth on a two-out, two-run double by Mike Scharbarth. San Diego Manager Britton Scheibe was disappointed with the loss, but could only give credit to Smith. “We ran into a pretty good pitcher, we faced him before in the World Series, so we knew what to expect, but he was on his game.” he said. Sansone also was impressed with the tournament competition as well as his team’s championship. “We faced some good competition in the playoffs, we played really well defensively and we only gave up seven runs during pool play. We just did what we had to do” he said.